We all know that Wikipedia is an immense project. It is an incredibly impressive coming-together of human labour on a scale that the world rarely sees. Over the last few years, we’ve also seen a few maps of the encyclopedia (including my own) which have shown that the project is far from complete (whatever that might mean). 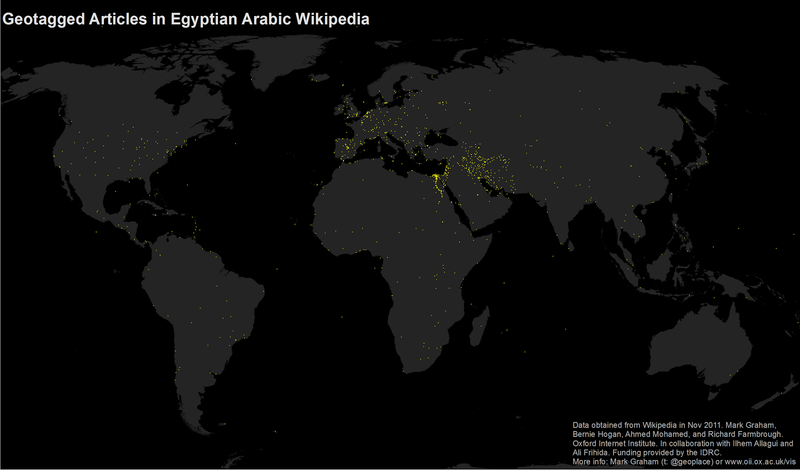 That doesn’t mean we should stop mapping the project though, and as part of our efforts to answer the first of our research questions looking at Wikipedia in the Middle East, North Africa, and East Africa, I’ll present these global-scale maps of every article in the November 2011 versions of the Arabic, Egyptian Arabic, English, French, Hebrew, Persian, and Swahili Wikipedias. Each one of these yellow dots represents human effort that has gone into describing some aspect of a place. 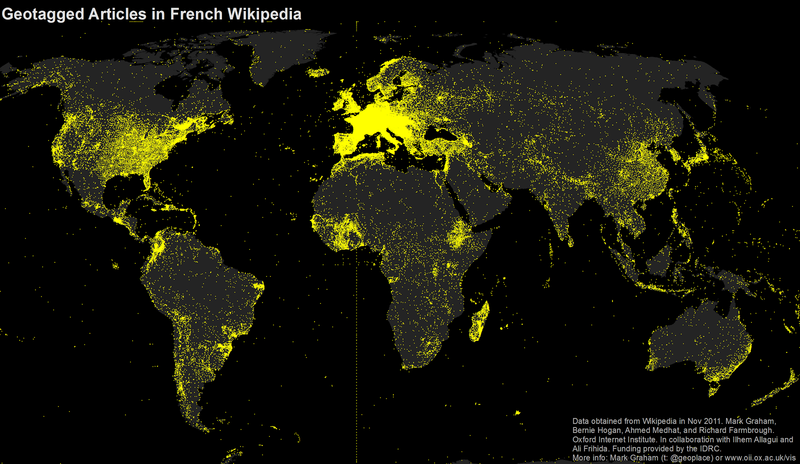 The density of this layer of information over some parts of the world is astounding. Some of our future posts will look more closely at measures of inequality in Wikipedia, but it is still hard not to be awed by this cloud of information about hundreds of thousands of events and places around the globe. 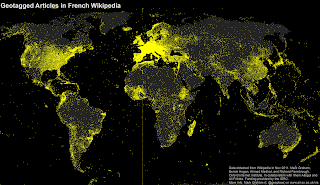 The French Wikipedia, with almost a quarter of a million geotagged articles, is much smaller than the English version, but nonetheless still another impressive collection of human labour. 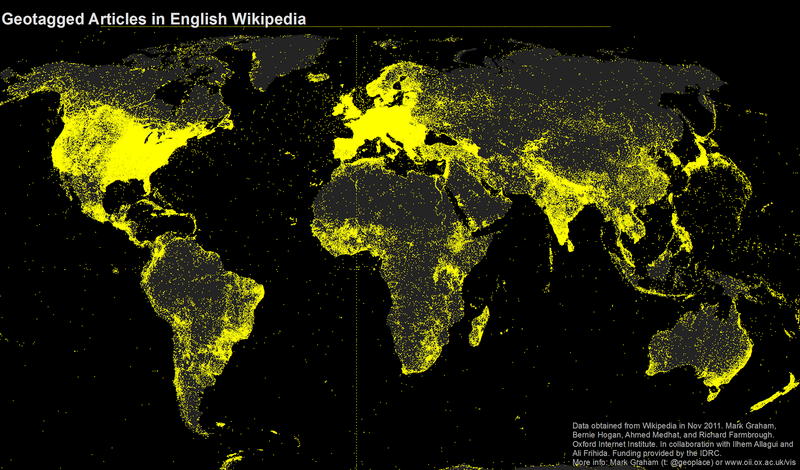 There are much denser augmentations of information are much denser over some parts of the planet than others, but it remains that there is simply a lot of content about a lot of the world. However, when looking at some of the smaller Wikipedias like Arabic (and Egyptian Arabic), Hebrew, and Persian, we don’t see that same glowing cloud of information over much of the world. In the maps above we instead saw limited global focus. 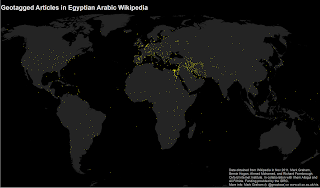 This is perhaps not that unexpected given the relatively small size of these encyclopedias (in terms of total numbers of geotagged articles, Arabic has 24,000, Hebrew has 15,000, Persian has 21,000, and Egyptian Arabic has only slightly more than 1000 [these are all approximate figures]). But it remains that if your primary free source of information about the world is the Persian or Arabic or Hebrew Wikipedia, then the world inevitably looks very different to you than if you were accessing knowledge through the English Wikipedia. There are far more absences and many parts of the world simply don’t exist in the representations that are available to you. However, one thing that should be pointed out are some of the strange patterns on parts of these maps. If you look closely at the Arabic or Persian maps you might see some interesting patterns (for instance look closely at the patterns in the US). 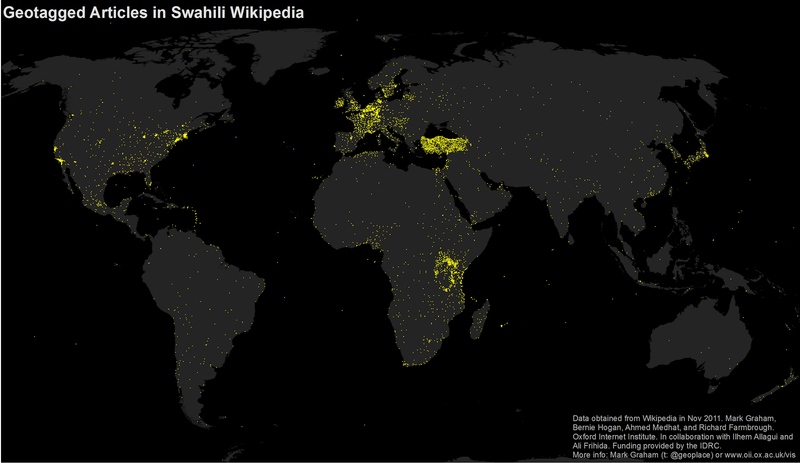 You see a similar sort of unexpected spatial distribution of articles in the map of Swahili Wikipedia below (i.e. why are there so many articles in Turkey?). The answer is simply a few dedicated editors creating stub articles about relatively structured topics such as cities in Turkey (in the Swahili Wikipedia) or every county in the US state of Georgia (in the Arabic Wikipedia). 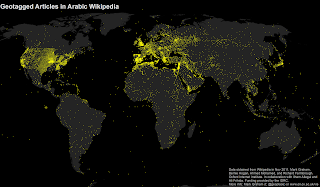 What is perhaps most interesting about the Arabic, Hebrew, Persian, and Swahili Wikipedias is that it isn’t the Global North that vanishes from the map. It is rather other parts of the South that become absent: an observation that seem to simply imply an entrenchment and a reproduction of the visibility of the already highly visible.